Scott Mauro’s career spans from the late 1970’s when he first landed his job working on the hustling bustling Broadway circuit as a press assistant. Scott’s career flourished as he worked his way up Broadway’s hottest shows, where Disney eventually recruited him. We caught up with Scott at our Gower location where he has been a tenant for 4 years, to ask about his latest projects and to see what his Valentine’s Day plans are. You started your career working on Broadway in the late 1970’s. You were a press assistant. Tell us a little bit about that position and who you worked for. I started my career as a publicist for Broadway shows and then I wound up doing advertising for Broadway shows. That was for the original production of Barnum, Betrayal, among others, there were so many I can’t even think right now. But it was really exciting. I attended opening nights, went to incredible parties, I had so much fun. All the things you can imagine. How did you land the initial job? I literally knocked on doors. I knew what I wanted to do very early on when I was a kid. I grew up in New York, and attended Broadway shows. I knew my calling, so after I graduated from college, I sent out a 180 cover letters and resumes. We had to type them out in those days! I did not have a copier; none of that. I networked and I was able to have Liza Minnelli as a client when she was white hot. I had Frank Sinatra and I had Diana Ross, David Bowie. I suddenly was doing advertising for not only Broadway shows, but with various artists when they were out on tour and I did album releases. You established your production company in 93’, how did that come about? What motivated you to do that? Well it was very simple. I was head of TV specials for Disney. Disney recruited me out of New York. So because I was working with all of these stars in advertising, the stars would take me along with them to do these TV shows. From that I became a producer. I started producing shows like Night of 100 Stars for ABC and the Tony Awards. I was working with great executive producers who took me under their wing. This was all because of my advertising career. I ended up doing four TV specials for Disney, which aired on NBC. Then I received a phone call from Cher’s team. Cher was going to go out on tour: If I Could Turn Back Time was first tour since Sonny passed away. It was an 15 month job and on top of that I was doing the TV special with CBS. So I was able to leave my job with Disney and have a little bit of security to open up my own production company. How has the advertising industry changed from 93′ to now? The biggest change is digital and I love it. Vine, Periscope, Instagram, Snapchat. I was ahead of the pack when it came to the transition into the digital age. I was the first person to put a Broadway show on the Internet. It was a Rodgers and Hammerstein revival and It was primitive in that we put up reviews and pictures, it was very static, but we were the first ones to have a website for a Broadway show. At the time, I didn’t think it was ground breaking, I just knew that we should do it and it was all part of the advertising/marketing strategy. [laughs] No one has ever asked me this before. I don’t know, let me think about this one. I’m thinking maybe Zachary Levi, yes Zachary Levi. I’ve worked with him before and I can see him playing a good father and I see some similarities. But wait, I think I’m changing my answer, I pick David Schwimmer. Yes, because David has the right personality traits and the audience can relate to him. What is the biggest headache during the process of producing these live shows and events? It’s always budgets. It always comes down to budget. You want to do the best show you can. Some people don’t want to see the bigger picture and they want to be penny pinchers. It doesn’t always take a lot of money; it just takes money wisely spent. So you must have good venders in place, people who are on the same page. You must work with the same people for the most part. Yes, I have had the same team for 20 years both in New York and in Los Angeles. With very few replacements and I’ve really put together a great team. In fact on a show I recently did with UNICEF with Mariah Carey and Elton john, somebody from UNICEF came up to me and complimented me on the people that work for me. Favorite actor/performer you worked with? Oh boy, there’s several. Hugh Jackman was great. We collaborated very closely on the Museum of Moving Images Salute to his work. He was great fun. I got to know him and his wife and we hung out a little bit. But for the most part I pretty much have good experiences with most people. The one that I am in most awe of that I worked with is Frank Sinatra. I was part of his team for 18 years and that was quite an experience because he was truly larger than life. What three things do you need to be successful in your industry? What are deal killers for you? You have to be passionate, you have to be persistent; you’re going to get a lot rejection. For every yes, you’re going to get 30 no’s and you have to know how to be diplomatic when handling people. I have a reputation for being tougher than most, and that’s fine with me. I’m tough but fair. I’m fair but I’m tough when I need be tough and sometimes whether it be a huge creative team or talent, they may push over the boundary and you have to know when to say enough. But being tough but fair is very important. And what is a deal killer for you? Arrogance. Absolute arrogance. You meet some people who have absolutely no qualifications who are just full of attitude to make up for it. This could be off the record, who has been difficult to work with? No I don’t care, you can put it out there. It’s interesting; I had a really hard time with Sean Connery. No matter what we did we couldn’t make him happy. But then I met him a couple of months later and he absolutely loved my work, loved the evening. He not only became a fan, but he agreed to come to another one of my shows. It’s the most unbelievable story, he turned out to be a pussycat. On February 9th you’re going to be holding the 13th Annual Woman’s Red Dress Awards 8 years is a long time doing this, what is going to make this year different from the past? I actually created it; it used to be a cocktail party in a bar where they handled out these little statues. But Larry King who is committed to fighting heart disease because of his cardiac foundation, he brought me in and recommended me to turn it into what it is today. I made it into a show. So we booked the Lincoln Center and then we brought in musical acts and we give out 4 or 5 awards during the event. Over the years we’ve had CeeLo Green, Colbie Caillat, Elvis Costello, Sara Bareilles. There’s a pre-show with photo ops, step and repeat, red carpet, passed hors d’oeuvres. Then we do the show, which is 90 minutes, no intermission, theatre seating. Finally, there’s a 2-hour party with a live DJ and more food and more drinks and all the women wear red. It’s actually one of the most fun events that I do and I’ve very proud of it because it’s for a great cause. Who is on this years lineup? This year we’re going a little country with The Band Perry. We have a woman who is an impersonator; she’s going to be singing “Natural Woman” in 17 voices. So from Britney Spears to Bernadette Peters to Celine Dion straight through, it’s exciting. 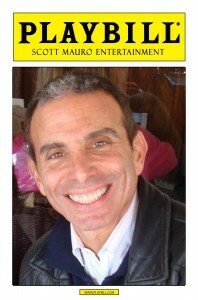 Where do you see Scott Mauro Entertainment in the next 5 years? I want to do more TV specials and more Broadway shows. I would love to bring together a great cast. You look at The Sound of Music Live and it wasn’t critically acclaimed but the ratings were phenomenal. Now we have Grease coming up on FOX, which is going to be great. I have one or two good TV specials in me. Maybe more. If you could sing one song on American Idol, what would it be? “New York, New York” I was born in raised in New York. I’m a die hard New Yorker. I’m not a singer but the song swings a little bit and I could fake it. How are you going to be celebrating Valentines Day this year? Valentine’s Day is a hugely important holiday for my wife and I. This is our 40th Valentine’s Day. Not married, but 40 years since we have been celebrating Valentine’s Day together. We knew there was something going on between us 40 years ago on Valentine’s Day, so it’s a very special day for us. Our first date was the week after Valentine’s Day and in college we used to give each other cards. My wife and I will have brunch that day, she’s picking the place and you better believe I’ll be coming home with chocolates and flowers.